Three Rooms Press—the fierce New York-based independent publishing house inspired by Dada, punk and passion—presents an evening of incredibly provocative, disruptive and eclectic art and performance celebrating the launch of MAINTENANT, the annual contemporary Dada journal at 2016 Entrez ¡DADA! 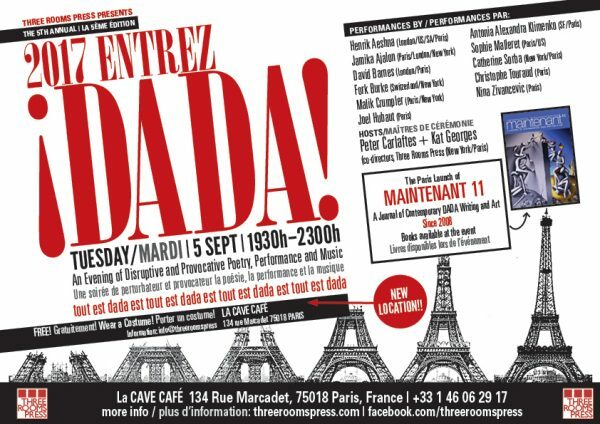 Paris Tuesday, Sept. 5, 1930h–2300h at the art/music venue La Cave Café. Costumes encouraged. Admission is free. The event promises to be a wild ride of performance from leading contemporary Dada artists and writers from Paris, Switzerland, and New York, including visual artist and performer Malik Crumpler (New York/Paris) performance & visual artist Joel Hubaut (Paris), performance poet Fork Burke (Switzerland), poet/producer David Barnes (Paris/London), and New York-based performance poet Sophie Malleret. Additional Paris-based performers include dada poet-artist Henrik Aeshna, poet Antonia Alexandra Klimenko, poet Jamika Ajalon, author/director Catherine Sorba, poet-conceptual artist Nina Zivancevic and actor Christophe Touraud. Peter Carlaftes and Kat Georges, co-directors of Three Rooms Press (New York) will host and perform. The event also includes the Paris launch of the internationally-renowned MAINTENANT 11: Journal of Contemporary Dada Writing and Art (2017, Three Rooms Press), which features more than 150 visual and literary works by artists and writers worldwide on this issue’s theme “Eye for a Lie.” The journal will be available for purchase and signing at the event. Admission is free. Doors open 7 pm. LA CAVE CAFÉ, 134 Rue Marcadet, 75018, Paris, France | +33 1 46 06 29 17. For additional information and press enquires, please contact Peter at info@threeroomspress.com.